We have a customer with Exchange Server 2003 and Acronis Recovery for Exchange. He can do backups of the mailbox store, but when he wants to select the public information store, the is an error, Acronis Error 11939877, MAPI error 1.287: The contents of this public folder are currently unavailable. We served him with whitepapers about the permission settings on the exchange server and he told us, that permissions are ok.
Have you any ideas, where he could find the problem ? Welcome to our Forum, we're glad to greet you here! I understand your concern, and will be glad to help you. 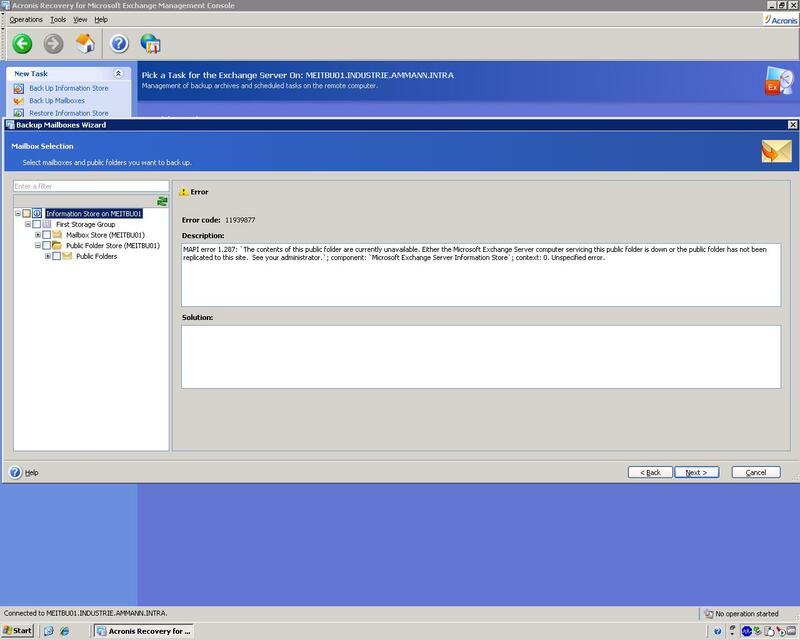 Collect AcronisInfo output on the computer where Acronis Recovery for Microsoft Exchange Agent is installed. See AcronisInfo Utility. Provide a detailed step-by-step description of the issue and get a screenshot of the error message, if applicable. Specify what user is used for connecting to Acronis Recovery for Microsoft Exchange Agent. Create a screenshot of Member of tab in Properties window. Is Exchange server in question is a part of a cluster? If Console and Agent are on different machines, collect PCAP logs: see Collecting PCAP Logs. Get the IP addresses of source and target machines. After that please open a support request with this information attached, and let us know it's number. The data collected will help us to localize the cause, and find an appropriate solution. We collected the data, but I am not able to open a support case (unfortunately). I sent some MAPI-Tools for testing to the customer and this showed up, that they cannot access public folders with MAPI with other applications, too. So the problem is not in Acronis. The security settings seem to be ok. They can backup all the mailboxes of the specific server. When they want to select the public folder store of the specific server, Acronis wants to list all public folders of the organization, not only the public folder store of the selected server! Now why Acronis wants to show the folder "Public Folders" of the organization and not the public folders from the specified public folder store ?? Or, in other words, is there a way to force Acronis to choose/browse only the public folders of the selected server ?